I was so happy to recently rediscover this painting on the left by Thomas Cole. 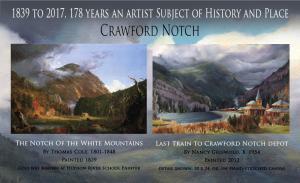 Through research have found that numerous painters both well known and not have painted this viewpoint of Crawford Notch spanning the last 178 years. I was unaware of this when I painted mine. Crawford Notch, a deep valley in New Hampshire's White Mountains is off Rte 302 which passes through the northern part of the White Mountain National Forest region. Discovered by the English earlier, it gained notoriety in 1826 when nine lives including the Willey family were lost in a catastrophic avalanche there. The Crawford Notch depot train station was constructed in 1891 and the Crawford Notch Hotel, (built in 1850 burned down in 1972) is now the site of the Highland Center Headquarters for the Appalachian Mountain Club. Painted in 1848 Thomas Cole's oil painting depicts the site of an earlier landslide which prompted Mr. and Mrs. Samuel Willey and their five children, along with two farmhands to immediately leave their home in Crawford Notch and construct what they thought would be a safe haven close by. Instead, they ran into the very path of disaster. The avalanche struck their refuge the very next night. All were killed. 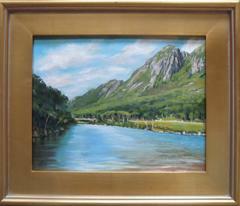 My painting done in 2012 was started en plein air on location. I was standing on the AMC grounds in front of the Highland Center Headquarters in late October. I witnessed the very last train of the season come into this depot from it’s mountainous journey through the east side of the White Mountains. I had to leave this site early due to weather. It was windy and very cold after 3 hours when the sun was setting. I completed in the warm confines of my studio room in Campton, New Hampshire. The original is available and print reproductions are available at this link. With current issues faced today by those at Standing Rock and the slaughtering of bison and other animals my heart continues to weep for all of us and the children who will inherit this earth. This is for those who stand strong in defiance of the threat to our natural resources: (Our Native Americans, those who support the climate change issues, environmentalists, scientists and those who support the causes). I started this work long ago but happened to finish it during the recent surge of media and crisis. A friend posed for the figure and I gathered research for the symbolism I wanted to include. 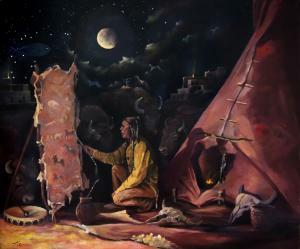 The Lakota historical photographs showed fully decorated hide skinned teepees from top to bottom, thus the hide painter. Often the Native Americans painted pictograph symbols and animals which told stories and history of events on hides. This is a dream painting and created in my studio from imagination and resources to honor those affected by these tragedies. As with some of my other Native American oil paintings, I choose to paint limited palette, this one with reds, violets, oranges and the warm side of the color wheel to express the global warming of our plant. I wanted there to be a strong contrast between the lights and darks enhancing a drama to the concerns so I have lit the scene with imaginary fire light and moon light and well as a fire that burns inside the teepee. This is the brighter starts shown above the stretched hide on the left. Buffalo is the symbol of sacred life and abundance. The skulls represent the threat to their own existence and also a threat to the existence of conscience of sacred and spiritual life itself. Symbolism: The ancestors and animals in the sprit world. A dream and prayer to those who exist in spiritual forces and our ancestors. The horse represents the Swiftness, (needed in action to protect our resources). Upper right and left: Symbolism: Fire may be used for purification. Cedar and sage are used to clear space, to purify and to repel spirits that are not welcome. In use for purification, fire consumes the essence of the items that need to be disposed of in a ritual way. Representing tribes and people uniting together who oppose the destruction of our water and natural resources. Symbolism: the heartbeat of Mother Earth. The drum is broadly considered to be the first musical instrument used by humans. It is believed to have the power to change natural elements, including the weather, to heal sickness, and some believe it has the power to send messages both to the animal world and to the spirit world. Both made from natural resources of clay and reeds, non polluting natural materials were used for utilitarian objects. The native Americans an our early ancestors did not use plastic or unnatural man made materials; they created and invented items for use using only the resources available to them for the earth and did not leaving enormous amount of trash and waste that we leave behind in our societies today. Symbolism: Art in the Native American culture. The moon creates shadows in darkness. Darkness of night here is representing the darkness of our times. Natives used the stars to tell time, navigate the rivers and seas and predict the future. Historians have inferred that the natives thought of stars as the spirits of their ancestors and they honored each with a name and symbol. Some sources mention that Native Americans used stars' positions to indicate specific seasons or events of the year such as harvest time, planting time, buffalo hunt time and so on. Their interpretation and use of the star positions and constellation vary significantly from the astrology of the modern world. Squiggles found on the bottom left off the hide in thinking of the present day water protectors and those at Standing Rock. Guardian of the West and has the power to heal and to transform passions into true wisdom. Please take a look for new gifts at my new page on LULU. I have Calendars of my works ready for orders, they are very high quality print and stock. It has been a personal mission to return to the White Mountains and paint scenes of this beautiful and thought provoking place in northern New England. Other artists have tread before me and inspired me. The works here can only express my journey and magnetism to this natural place of beauty, drama and solace. 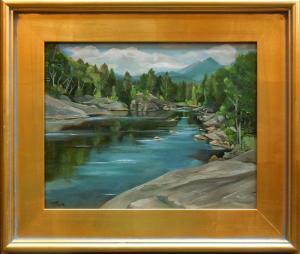 I lived and worked as an artist in the White Mountains for 13 years around 1985 to 1998, then left for several years to expand my capabilities in southern New England. I have returned, drawn back to the Mountains by 2010; this time with an urgency to paint and explore the White Mountain areas on a deeper level through oils. Whether I stay here in the future is not determined. 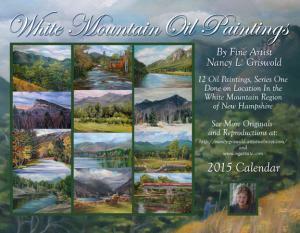 For now, I have intentions of completing an oil paintings series of the Whites Mountains of New Hampshire. This show in Lincoln bears witness to the mission through the few oil paintings I did since my arrival. When I was away from the Whites, I missed the air, the dramatic weather, the people, villages, old friends, artists and creatives I felt comradeship with in the White Mountains. I missed the quite time, where reflective and spiritual thoughts occurred through quiet observation. I also missed sounds of nature, gorgeous scenes, the freedom to walk with nature and breathe clean air. In southern New England I was enthralled by the museum displays of the Hudson River School Painters and the American Impressionists (who encouraged my new passion for plein-air oil painting). 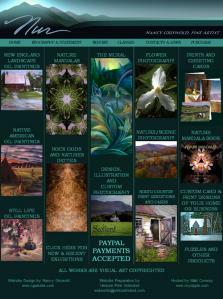 These artists brought my love for northern New England closer; as many of them painted scenes of the White Mountains. In thought provoking times after several family deaths, I felt a new path unfolding; it was time I must return to paint the places I had come to love and miss, before it is too late; the places of the White Mountains of New Hampshire. The concern for continued conservation stewardship deeply stirs my mind and heart when painting the natural landscape in the Whites. I now witness the changes that occurred during the years I was not here. I do hope that at the end this mission, this collection of oil paintings may come to serve as a token which enlightens the need for greater efforts in preservation and conservation of our White Mountain areas and towns. This is a powerful place, a place where the next generations are deserving of all its natural magnificence, grandeur and the historical resonance we have been so lucky to witness and enjoy. All these works started on location, some have been finished in studio and others not. The plein air approach I planned for this 2012; canvases are now prepared for this ongoing mission. I am still jostled by the hectic demands of modern living like many, yet the core mission remains strong inside and grounds me as of present. The project will be completed in its own time frame as situations and opportunity permits. I have long admired many artists from the past and present day that are committed to painting beautiful and breathtaking places on the earth. One of my favorite places in the Northeast has always been the White Mountains of New Hampshire. 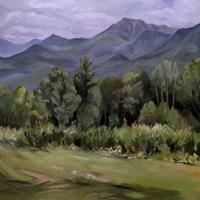 Sometimes feel it was a primary purpose to return here to paint a collection of oils in the White Mountain National Forest. The present day threat of the Northern Pass is just once consideration for their scenic demise that constantly occurs here through time. Mere growth in population and building development is another. When I moved away from New Hampshire, I would look at film and these art of the Hudson River School Painters and others who have contributed to glorifying and illuminating these mountain landscapes. Works by J. Champney, Frederic Church, Thomas Cole and many others would captivate my attention at museums and in books when I was not able to be here. As I am painting these works I meet many new and interesting people. Some were tourists from afar and others where locals that share some history of these magnificent locations. Researching the history of the areas that I choose to paint is also challenging as some information was hard to find, in some cases. Many people who have lived here for a long time do not know the names of these mountains, as there are just so many of them. 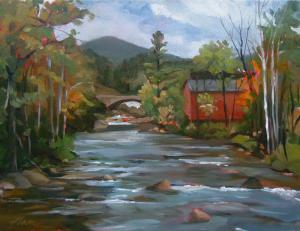 The Appalachian Mountain Club and internet bloggers have some facts I need to identify the places I stand to paint. Not only do I enjoy the mission of painting, but also learning more history of this area. I will keep all these notes and the identity of these mountains for posting or and exhibit later. I developed a true heartfelt respect for all plein-air and outdoor painters very early into this project. It is truly challenging to set up my equipment and paint under some weather conditions. Warm and stagnant air attracts bees and black flies to my paints and they often became stuck to the wet canvas. Often it can take me 2-3 days to recuperate from massive black fly bites and to desire to paint outside again. I have become overheated and then chilled to the bone under varying weather conditions. Most of the paintings you see here have been though thundershowers, coated with water and debris carried from gusting winds. Very frustrating at times, yet I have definitely noticed that once a work is completed inside it can loose some of the vitality that outdoor painting seems to bring to freshly painted canvas. As many artists, I struggle for the hours of time to fully commit and gain momentum with my work and this project. During this part of my life, I feel I need to do this project now as I will never be fully ready for a more dedicated undertaking. As usual, in current 20th century living, these paintings are developing slowly, during fragmented periods of time. I long for companionship of other painters, but have always respected the fact that the missions of others are often different than mine and available time to meet and work together is infrequent. As I paint I post my work on facebook and have acquired friendship and encouragement of many other painters a cross the country. I know now that I am not alone in this pursuit; there was something here for me, something on the inside that made me want to be in these White Mountains of New Hampshire for this period of time to do just this�paint them. Running parallel to this series is my other series of architectural print renditions of landmarks and scenics in New England with a bit of nature and scenic photography. If my hands are in the arts during the day, it helps the days I resume painting again. The principals of art are applied and practiced in many media much like a piano player who practices scales; I can practice my visual skills in many ways. I will continue on with these works. I hope to do 25 -35 canvases in total of the White Mountains. The sun dried grasses of August are arriving. Autumn and winter will soon approach giving a scenic and colorful change to these landscapes. Hopefully I will have more time to get out for painting now that I am more prepared for another winter and settled in more. Hope you will all enjoy my new website, a new beginning in the North Country with a new and updated site.